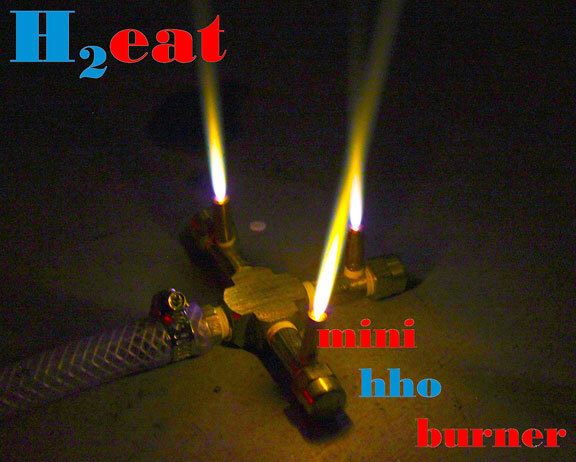 H2eat Mini HHO Burner A custom made HHO burner, which operates from clean burning hydrogen and oxygen from water. This burner produces a hot flame that can be retrofitted to a small BBQ Grill or cook stove. The mini hho burner has 3 flame tips and can be operated optimally at 3 LPM of HHO and, depending on the generator, consume only 500 watts of input power. This burner is excellent for use with lower output hho generators. Designed by Jacob Wall. ( 38 amps/12/14volt will run 3 LPM.) Comes with instructions and video links from Jacob Wall. Comes with specailly designed flash back arrestor inside the burner.